Irish Breakfast Tea is a blend of quality black teas from Africa and India. 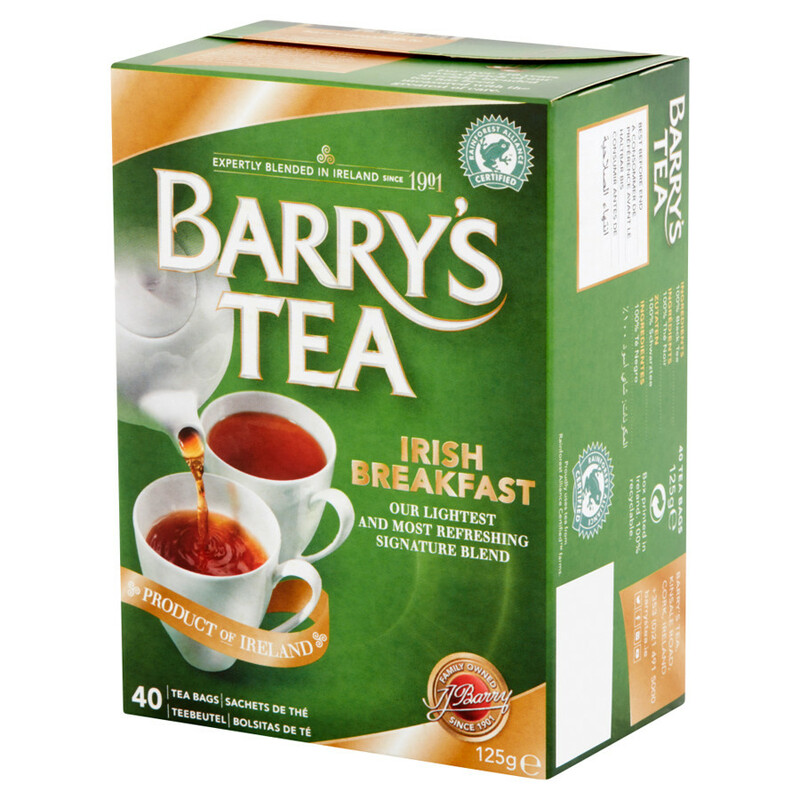 The Irish Breakfast is best known in Ireland as the Original Blend, it's the lightest and most refreshing blend of Barry's Tea. Irish Breakfast Tea is a blend of quality black teas from Africa and India. Brisk, refreshing and light, it is a great breakfast cuppa and it may be enjoyed at any time of the day. Green box of 40 black leaf teabags. A family history Barry’s Tea was established in Cork in 1901 by James Barry, grandfather of the current president of the company, Peter. Quality has always been central to the company. Indeed, as early as 1934, Barry’s won the Empire Cup, an award attributed to its quality blends. Until the 1960’s, tea is mainly imported from India and Sri Lanka and then sold in the small shop on Prince’s Street, Cork. 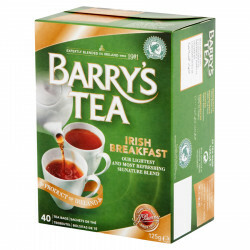 Enjoying growing success, Barry’s started selling tea in others shops in Cork, then in the neighbouring cities and eventually in all Ireland. At the time, the tasting staff discovered teas from East Africa, and these fresh, aromatic and golden-coloured new teas met immediate success. Word of mouth developed the brand and Barry’s became part of the Irish brands national heritage. Today, the brand represents 40% of the tea market in Ireland and is exported worldwide. Barry’s processes are respectful of tea-producing communities, and ensure steady controls of incomes while supporting local projects. A commitment to quality that has made Barry’s the favourite tea of the Irish for more than a century... Their secret: a careful selection of the best teas worldwide to create a refreshing, delicate and fragrant blend! Barry’s developed unique blends under the constant supervision of Denis Daly, Master Blender at Barry’s. The range recently expanded with the arrival of organic green teas and fruit and herbal infusions. These selections are perfect to add variety to your daily hot drink choices! The Classic Blends, Irish Breakfast or Earl Grey will be perfect at any time of the day, from breakfast to evening tea. The rich, classic blends may be enjoyed with milk, while Earl Grey offers a delicate bergamot scent. You may also opt for decaffeinated tea. Barry’s, for the pleasure of tea lovers, also developed a large range of loose tea and teabags! Ingredients: blend of quality black teas (Africa, India).